Rep. Ro Khanna, D-San Jose, is calling for congressional hearings over reports that the crown prince of Saudi Arabia ordered an operation to lure journalist Jamal Khashoggi out of the U.S in a plan that may have led to his assassination. Khanna said that the alleged killing of Khashoggi, a Washington Post columnist, should convince lawmakers to end U.S. military aid to Saudi Arabia's military campaign in Yemen. "We need to stop arms sales to the Saudis. We need to look at potential sanctions," said Khanna, a leading House critic of the kingdom. Khashoggi, who was living in Virginia, has been missing since he entered the Saudi Consulate in Instanbul, Turkey last week. The New York Times reported that the journalist was assassinated by Saudi agents at the consulate. The report cited anonymous Turkish officials who claim that Saudi agents used a bone saw to dismember his body and remove it from the building. Turkish media are reporting that royal guards, intelligence officers, soldiers and an autopsy expert were part of a 15-member team from Saudi Arabia that targeted Khashoggi. Saudi officials have called allegations that it abducted or harmed the journalist "baseless." But late Wednesday, the Post reported on U.S. intelligence intercepts of Saudi officials discussing a plan to detain Khashoggi, a prominent critic of the Saudi government and Crown Prince Mohammed bin Salman. "It's appalling," Khanna said. "The allegations are very serious, that the Saudis are engaged in human rights abuses against a journalist who is an American resident." "It calls into question our relationship with Saudi Arabia," he added. A bipartisan group of senators sent a letter to President Trump on Wednesday, calling for the administration to impose sanctions on Riyadh if it is found responsible for Khashoggi's disappearance. The letter says the columnist "could be a victim of a gross violation of internationally recognized human rights." Khanna has repeatedly introduced resolutions to end U.S. aid tied to Saudi Arabia's war against the Houthi rebels in Yemen. The most recent resolution was introduced last month. He said he hopes the scrutiny over Khashoggi's disappearance will provide momentum to congressional efforts to end U.S. involvement in Riyadh's actions in Yemen. 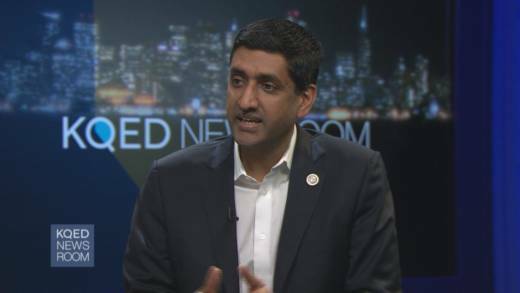 "This is something, whether you are a Republican or Democrat, you cannot tolerate," Khanna said. "The Saudis have engaged in a brutal civil war in Yemen," he said. "This shows that they are a regime that does not value basic freedom." The Saudi government leads a coalition of Arab countries that support Yemen in the country's ongoing fight against the Houthi movement, which is backed by Iran. The U.S. is among several countries supplying that coalition with weapons and military intelligence. Trump has expressed reluctance to reduce arms sales to Saudi Arabia. "Well, I think that would be hurting us," Trump told Fox News Wednesday night. "We have jobs. We have lots of things happening in this country. We have a country that's doing probably better economically than it's ever done before. Part of that is what we are doing with our defense systems and everybody is wanting them, and frankly, I think that would be a very, very tough pill to swallow for our country," Trump said. A day later, in another interview with Fox, Trump called the U.S. relationship with Saudi Arabia "excellent."